New Buckenham was probably laid out as a defended town sometime in the middle of the 12th century. It was surrounded by a square moat that was at least five metres wide and three metres deep. In 1493 this was referred to as the ‘borough ditch’ and in 1598 as the ‘greate ditch’. By 1600 the moat was no longer being maintained and was becoming clogged with rubbish. In 1632 Charles Gosling, the owner of the Rookery, was given leave to build his barn across it. Today only the north-east corner survives to anything like its original width. The eastern section soon peters out but garden boundaries mark the inner edge of the ditch. South of the road the ditch is traceable only through documentary and archaeological evidence. The moat continued just to the west of Tanning Lane where a small excavation  in 1993 uncovered its western edge. By the garden of the Rookery it can be seen as a faint hollow which was still open water on 1886. The long pond forms the south-east corner of the moat. The canalised stream that skirts the southern edge of the town was formally thought to form part of the defences. 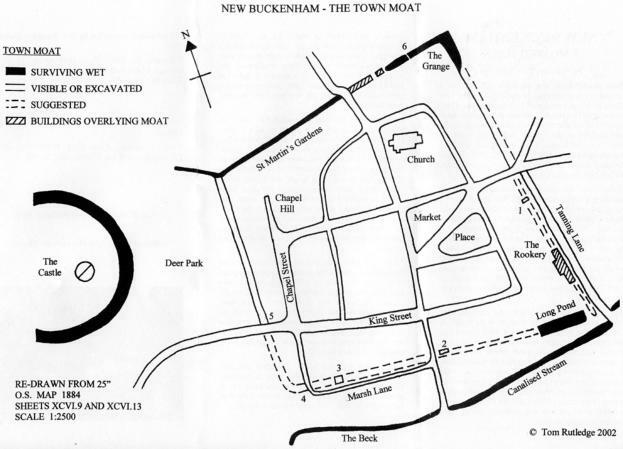 However a map of 1693 shows that the stream originally formed a more winding course and another of 1896 labels the present course as a ‘canal’ implying that the straightening was recent. The southern line of the moat was not discovered until 1993 when work on the foundations of Flint Lodge  revealed a three metre deep ditch. Within the fill were parts of a wooden structure that was probably one of the three sluices recorded in 1578. Further archaeological work by the Norfolk Archaeological Unit on the site of Woodbury Cottage  revealed a ditch up to nine metres wide with an internal bank. This confirmed the alignment of the moat, which appears to have run just north of Marsh Lane, linking up with a short section of ditch  that has only recently been backfilled.